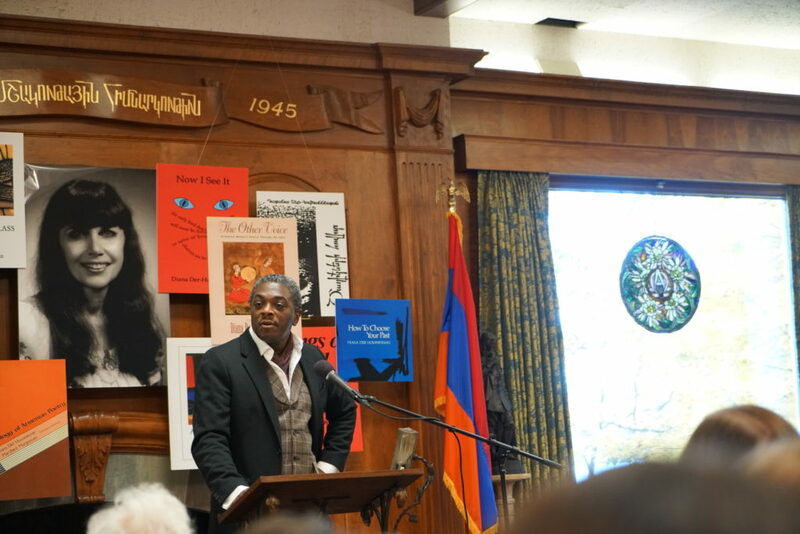 Poet and BEI Emeritus Fellow, Regie Gibson helped to pay tribute to poet Diana Der Hovanessian. For link to original article. ARLINGTON, Mass. — On the afternoon of November 4, the award-winning late poet Diana Der Hovanessian was feted at the Armenian Cultural Foundation (ACF) by an enthusiastic audience of about 150 people in the manner that she would have appreciated: through poetry, family, food and friendship. Poet Regie Gibson recited “Brat” and “Lot’s Wife.” “She was one of the first poets I had the chance to meet her when I came here from Chicago,” he said, noting that she was welcoming and encouraging. Gibson later recited “Summer Street, Worcester” and “This Is for Zarif.” In the former, she captures her feelings as a child who could not speak English mixing with the neighborhood children in Worcester. In the latter, she paid homage to a mother who refused to give up information about her son during the Armenian Genocide even when tortured brutally.